They call it the "Call of Duty Effect." Last December, one of the hottest search terms on Google was for a gun, and not just any gun: an assault rifle made by arms manufacturer Bushmaster, designed specifically to become the main battle weapon for the United States military. This is not entirely unheard of. New firearms - especially those with military ties - are generally hot items, but the Adaptive Combat Rifle, or ACR, was a different story. Although the rifle had been in the hands of military testers, even fielded with select units for some months, a consumer version had yet to be released and had only been hinted at by the manufacturer. In fact, as of the time of this writing, the rifle still isn't available to the public and may never be. And yet, for some reason, last holiday season, the "ACR" - a gun few people should have heard of and even fewer still have ever seen - was one of the top search items on Google. Steve, who prefers to use only his first name for reasons of personal security, is the owner of The Firearm Blog, a website devoted to the latest news and current events in the world of guns, and one of the people who first noticed the strange phenomenon of the ACR's Google rankings. "I was surprised because compared to the AKs, M4s and Glocks of the world, the ACR is relatively unknown outside of the industry," he says. Although Steve had been following news related to the ACR for the entire history of its development, he was baffled as to why anyone outside of the small circle of firearm enthusiasts would even know of its existence, much less be interested in purchasing one. Then it hit him: Among the many modern firearms depicted in Activision's Call of Duty: Modern Warfare 2 is the ACR, complete with an entirely fictional "heartbeat sensor" that alerts the player to the presence of enemies - a feature one member of The Firearm Blog calls "fantastic," and not in the good way. He came into a Pawn Shop I was shopping around at and asked for an "Ess Em Gee" (Submachine gun). The owner said that he didn't carry them. He then asked if he had any sniper rifles. The owner showed him a .270 (I believe). As the punk (hat cocked off to the side and his pants at a level where a belt would not allow them to fall) looked down the scope, he asked how to "zoom it" (a common feature of scoped rifles in video games). The owner showed him how to magnify and clarify the image. The punk said that he was just used to the rifle doing that for him. Finally the owner asked what the kid was looking for, to which he replied, "I just want to headshot some noobs! ... Like on Halo!" The entire thread about the ACR at The Firearm Blog is worth reading (and not only because the blog itself is one of the least wonky of the many, many blogs and websites written for firearm enthusiasts). 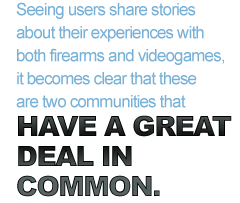 Reading through the posts in response to the "Call of Duty Effect" article and seeing users share stories about their experiences with both firearms and videogames, it becomes clear that these are two communities that have a great deal in common and that there are more gun-owning videogamers than you might think.